Cloudcamper provides cloud computing solutions and online software to small and medium business as well as to divisions within larger enterprises. The company is a reseller for both Zoho and Google Apps. Cloudcamper has its main office in Oostende, Belgium as well as five remote offices, each staffed by one of the company’s five partners. Each Cloudcamper partner has particular specialties and core skills that he brings to a client’s cloud solution. Some partners specialize in Zoho CRM, others specialize in Google Apps, still others specialize in Zoho Projects, Google Sites, and others applications. The distributed nature of Cloudcamper skill sets mirrors the distributed nature of the company’s work force. However, when a client needs a cloud solution that requires the talents of several Cloudcamper partners, the company has to act as a single, unified organization. To that end, the company needed a way to coordinate the activities of its partners and its contract developers working on any given client project. We need a way to manage our partners, said Philip Debaere, managing partner at Cloudcamper. “We also need a way to notify them of new tasks that have to be performed. For instance, when a new client project comes in, we need to let the right people know what to do and when to do it – like setting up user accounts in Google or Zoho. Without a way to manage these kinds of projects, things can fall through the cracks, especially with a distributed team. We use a combination of Zoho Projects and the contextual gadget, said Debaere. If we have a new project, we go directly to Zoho Projects, find the project, and appoint the owners. And the moment we do that, the owner gets an email, so he’s notified that there’s a project with some tasks for him. That way, everybody is notified for what he’s responsible. Cloudcamper relies on Zoho Projects to track the time partners and contract developers spend on tasks. Debaere and his partners review these time logs to calculate the profitability of projects and to uncover problems in project delivery. The information may be used to adjust prices to more accurately reflect time investments. 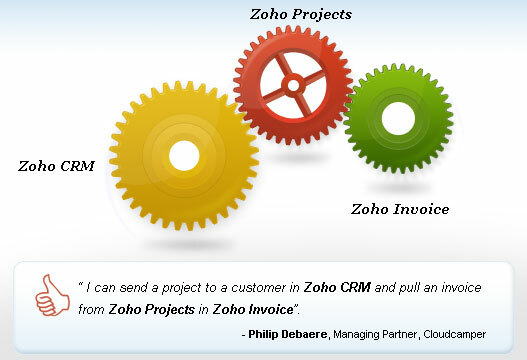 Zoho Projects is also used to manage customer support contracts. For every customer that has a support contract, Cloudcamper defines a milestone and a task. Anytime a customer calls for support, the user monitors the time spent on that task. Every month, the company pulls a report to see how much time is spent on support contracts. In addition to Cloudcamper’s five partners, another 15 contract developers are using Zoho Projects to manage between 15 and 25 projects. The company also uses Zoho CRM, Zoho Invoice and Google Apps internally as well as Zoho contextual gadgets for Gmail. For Cloudcamper, Zoho Projects provides cloud-based collaboration that supports the company’s structure and work style. "If we didn’t use Zoho Projects, our job would be hard. We’d have to use a shared spreadsheet or something to get an overview of all our projects", said Debaere. Now, we open Zoho Projects and in one view, we see all our open projects and their status.